Surgical Steel Earrings for sensitive ears in stainless steel amethyst fireballs. Sparkling and darling, these Studex Stainless Steel 4.5MM Fireball Amethyst Earrings are perfect for kids of all ages. This type is the “Fashion” style and is not “for piercing”. Each of the earrings have a rounded, notched post for secure wear all day long. The base metal is constructed of stainless steel for hypoallergenic protection against reactions and then polished to a mirror finish. Their size is approximately 1/8 inch in diameter. These crystals in the fireball pattern are quite striking. With multiple crystals in each earring, this style captures the light at every angle, and is like wearing a shooting star in each ear! 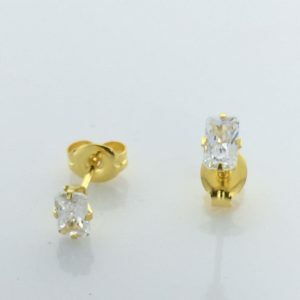 Each pair comes with a set of earring backs made with the same surgical stainless steel material. The notched post provides a safe and secure fit so they can wear them without getting lost. Beautiful, yet tough, they are also safe to wear in the shower, bath, or to bed.